Microsoft's disastrous roll-out of the Windows 10 October 2018 Update was put into stark focus last week when published data showed its adoption was only an eighth that of its 2017 predecessor. According to statistics gathered by AdDuplex, a Lithuanian company whose technology is embedded in thousands of Windows Store apps, Windows 10 October 2018 Update - 1809 in Microsoft's yymm labelling format - had been installed on just 6.6 per cent of all Windows 10 systems by year's end. That was a small fraction of the 53.6 per cent powered by 1709 - Windows 10's second feature upgrade of 2017 - at the close of that year. Windows 10 1709 was released 17 October, 2017, and was being distributed and downloaded to, and installed on, Windows 10 PCs for almost 11 weeks by the end of December 2017. Windows 10 1809 was initially released on Oct. 2, 2018, but within days Microsoft purged it from the distribution pipeline after reports of upgrade-caused data loss. Although the company returned 1809 to testing that same month, it wasn't until 13 November that it announced the upgrade was again being delivered to the general public. The re-release date was seven weeks before year's end. In a more apples-to-apples comparison, Windows 10 1709 was on 20.4 per cent of all Windows PCs by the end November 2017, a stretch of about six weeks. Even then, though, 1809's adoption represents less than a third of 1709's. No matter which start date is chosen for Windows 10 1809, its adoption has been the slowest of any feature upgrade recorded by AdDuplex. That data included 2016's single upgrade, designated 1607, the two from 2017, and the two from 2018. 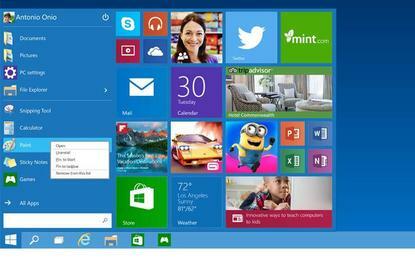 The same data also illustrated Microsoft's increasingly rapid roll-out of Windows 10 upgrades. 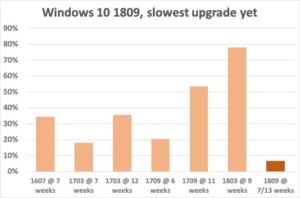 While 1703 was installed on a smaller percentage of Windows 10 PCs after seven weeks than its immediate ancestor, 1607, from 1703 to 1803 - a run of three releases - each follow-up upgrade landed on a larger portion of available PCs than its precursor within approximately the same length of time. That is, until the brakes locked up on 1809. Only Microsoft knows whether it was pushing too hard, too fast. From the outside, the upward trending line - every upgrade besting the one before it - hinted that Microsoft was lured into arrogance or lulled into complacency. Windows 10 1809 blackened Microsoft's eye - by AdDuplex's data, it's still punching - but it has also put users in a bind. Unmanaged Windows 10 personal computers, including but not limited to those running Windows 10 Home, receive and install each feature upgrade on Microsoft's schedule, not the customer's. Those systems are not only locked into every six-month upgrade schedule, but in the absence of any user-initiated action - so-called "seekers" who manually trigger an update request - Microsoft decides when to serve each PC. If everything remained consistent - that could happen - a Windows 10 Home machine or an unmanaged Windows 10 Pro PC would migrate at six-month intervals. The extremely slow roll-out of Windows 10 1809 revealed a problem with this lockstep strategy: Failing modification of 1903's arrival schedule, users will be pushed onto that upgrade not long after they've had to deal with 1809. If, for example, Microsoft opened the throttle such that half of all Windows 10 users ran 1809 by the end of January - admittedly, an extremely aggressive pace, considering - and 1903 was distributed on a more typical schedule and tempo, it's possible those users would have been on 1809 for as few as two and a half months before being dragged into the 1903 future. That's not exactly the six months Microsoft's promised users. Computerworld has marked this schedule compression before, but 1809 has become the first real example of significant consequences. And like traffic that stops and starts at odd intervals - the "accordion effect," aka the "slinky effect" - Microsoft's failure to meet the 1809 deadline will have follow-on impact on later feature upgrades. Will Microsoft push back the delivery of 1903 to compensate? Or will it try to restore the schedule by shortening the time available on 1803? Fortunately for customers running Windows 10 Enterprise (or Education), the deployment delay of 1809 won't be, well, much of a delay. Thank Microsoft's September 2018 support change for that. Then, Microsoft rejiggered support yet again by saying that feature upgrades issued each fall, those marked as xx09, would be supported for 30 months rather than the standard 18 months. Windows 10 Enterprise 1809 will receive security and non-security updates until May 2021; a few months out of that won't make as much of a difference as it would to the shorter span. And managed systems - including Windows 10 Pro PCs - that can skip an upgrade can often bypass fiascos like 1809.